Several hundred yards away on a neighboring ranch, a man with a high-powered rifle with telescopic sights had started his morning by nudging his ATV up a hill through knee-high dried grass to reach a 16-foot tower rising over the landscape. It was a comfortable perch once the ladder climb was conquered, a comfortably-cushioned, camouflaged seat with a padded rest for one’s weapon. The tower, sold under names like “Sniper Outlaw Deer Stand,” was one of several stationed around the man’s property. This one offered a sweeping view of endless acres of wide open land, which the man scanned through his telescope. Then, in the distance, a large dog appeared in his crosshairs, and the man’s finger tightened on the rifle’s trigger. Teesee Murray, a global vice president of a major software corporation who travels frequently, was home and on a business phone call that morning when she heard the distinct retort of a large-caliber rifle. She noted the time, almost subconsciously — 8:15 a.m. — and felt a fleeting chill before dismissing the moment; gunfire in the rural area is not uncommon. But shortly thereafter, Snoop Dogg failed to return home. 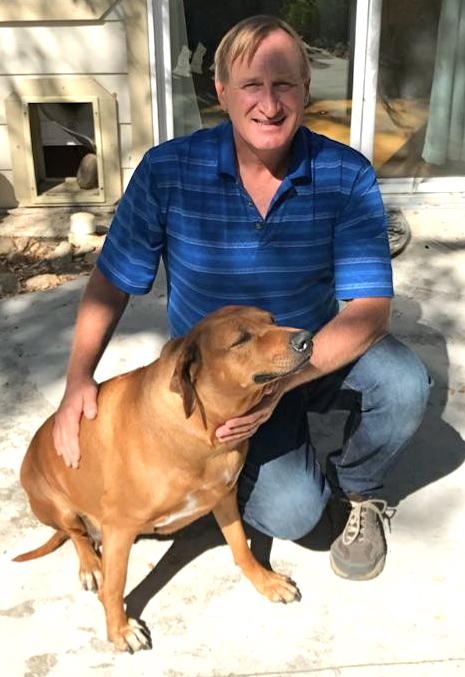 With husband David on a business trip in Colorado, Teesee and her three teenage children spent the day and part of the next searching for their missing friend. Then she noticed an ominous gathering of turkey vultures circling over one edge of their property. She walked, alone and apprehensive, to the site. There she found Snoop Dogg, shot through the heart, his big, strong body already ravaged by night predators. 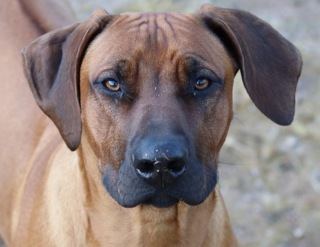 Almost exactly two years earlier, the Murrays had finally located and purchased the latest of the numerous Ridgebacks they had owned over two decades, a huge, playful, friendly puppy they simply called “Snoop.” He never let his AKC pedigree papers go to his head, the Murrays said. In his brief Creston residency, Snoop already had sired one litter of pups, helping earn about $25,000. At their birth, Snoop was so excited about his new little family that he awakened the Murrays and heralded the news by dancing happily as he ushered them to the delivery site. The two Murray daughters were planning to fund their college education with the Ridgebacks’ continuing enthusiastic procreation. Snoop’s mate, Pepper, is now pregnant with litter number two. Snoop’s pleasant and gentle temperament made him a perfect companion, David recalled as he drove a reporter in an ATV to view the sniper tower where the shooter had perched. David could barely suppress his emotions as he pointed up the hill, at the tower. David Murray and Pepper, Snoop Dogg’s pregnant mate. After showing Snoop’s body to sheriff’s deputies, the Murray’s 18-year-old son Spencer carried out the wrenching job of burying “our cherished family member,” David said. Until that point, David did not know what was happening back home on the family ranch. Teecee placed the difficult call to her husband only after Snoop was interred. Sheriff’s deputies interviewed a neighbor, Stephen William Almond, 65. David said deputies told him Almond admitted shooting Snoop Dogg, thinking the Ridgeback was a stray, was on his property, and that it might have been chasing a deer. Such a shooting would have been illegal under those circumstances. California law prohibits killing a domestic dog unless it is threatening livestock or humans. Even if Snoop Dogg was chasing wildlife, that would not be grounds for pulling the trigger, deputies told the Murrays. Sheriff’s investigators have turned their findings over to District Attorney Dan Dow, suggesting that criminal charges be filed against Almond. “We want Mr. Almond criminally prosecuted for animal cruelty,” David said. Almond did not return a reporter’s phone calls and text requests for comment. Spencer entered Cal Poly’s College of Engineering earlier this month with Snoop Dogg’s demise weighing heavily on his mind. The Murray daughters aren’t sure if they will follow their breeding plans. Teecee is awakened at night by the sound of gunshots in her nightmares. David seethes with anger over what he calls Snoop Dogg’s “murder,” and like his family he’s numbed by grief. All are talking with therapists. And now, the family has agreed that they no longer can live on the ranch with lingering memories of Snoop Dogg, and will be selling the property, David said. The Murrays said they haven’t heard from Almond. Almond violated California Animal Cruelty Laws period. Only a heartless person would cage a dog. Any responsible dog owner would keep control of their dog, either caged or leashed. I had heard about this shooting. But after reading this, there is so much more to this than I thought. I can’t believe that someone can get away with a shoot like this. How do you not know what your neighbors dog looks like? Even if it had been a stray and even if it had been chasing deer around. Shooting makes ZERO sense. I mean the dog could have been out for a walk with it’s owner. Hell, he could have missed and hit someone near by. Pets are expensive. Not only in time and money, but mostly in love. I know that if someone was to kill a part of my family, that person should always look over his/her shoulder. 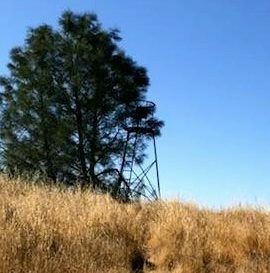 This shooter sure lives up to the brand name of his tower: Sniper Outlaw Deer Stand. High in his tower this outlaw sniper, who shot the neighbor’s dog, has the ability to view and fire directly into their house with his high power telescopic rifle. I can see why these neighbors can’t sleep. It would take a long time, if ever, to get rid of their grief and palpable fear for their future safety. The shooter seems to ignore their situation. Not helpful. Most shooters go to remote areas for their activities. One who chooses to menace his neighbors should himself be put in a facility with guard towers to keep him away from harming others. I hope and pray that he is charged with the felony he admitted to. Let’s all hope the law will act to restore peace. I don’ t know where to begin except that I am heartbroken over the loss of the beautiful dog. I live in the Pomar Junction area on 16 acres, unfenced. My dogs stay here just protecting the property. If anyone, anyone ever shot my dog – OMg I just can’t. The sheriffs would have to restrain me. This man needs to be account able as far as it can go. i know that Dan Dow and the County of San Luis Obispo will do the right thing as we take our family/ranch/winery dogs quite seriously.